The specimens on the photos below look a bit different from Megalactis griffithsi as it appear on the photos above. I cannot say if this is another species of Megalactis or the same species. 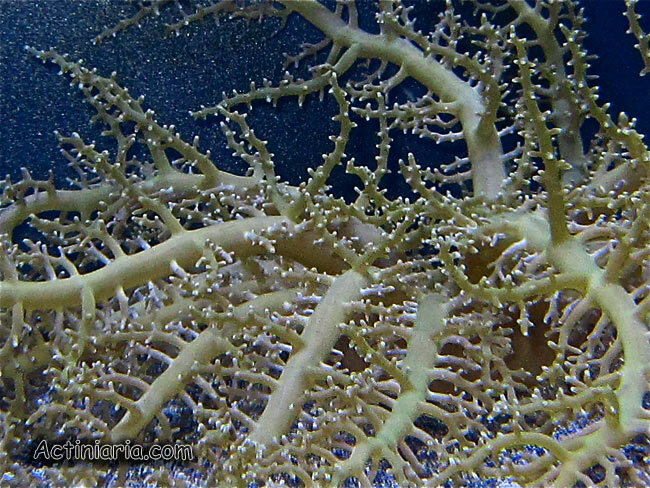 Anyway it certainly is a Megalactis, the branches on its long tentacles seem arranged in two series along the sides of the tentacles. 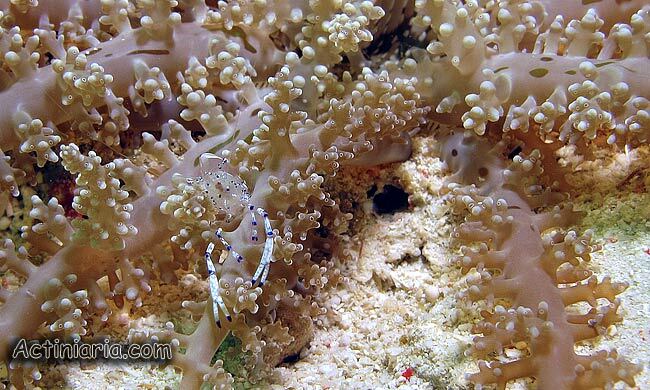 Megalactis is on of the three genera of tropical sea anemones belonging to the family Actinodendronidae which members also known as Hell’s fire anemones. They are very stingy. 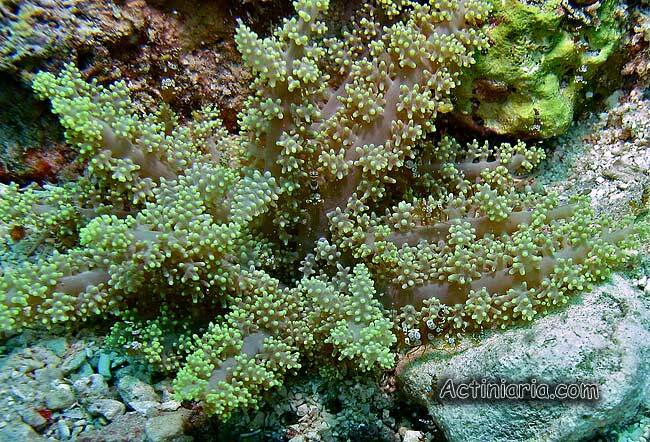 Two other genera are Actinodendron and Actinostephanus. Many internet images showing species of Megalactis are labelled as Actinodendron. 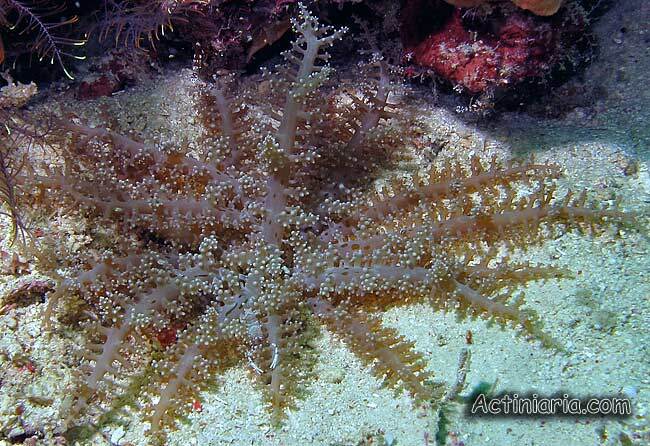 Megalactis differs from Actinodendron by the position of the branches on its long tentacles. 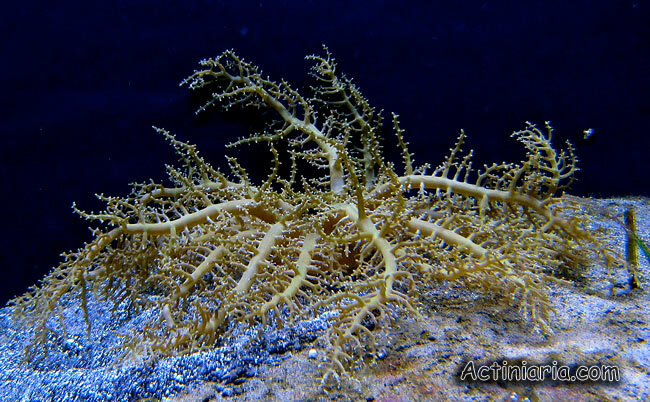 In Megalactis the branches are more or less clearly set along the sides of the tentacles, while in Actinodendron the branches are set all round the tentacles. Megalactis comata described in 2004 by Ardelean and Fautin (2004) from Taiwan (originally spelled as Megalactis comatus). 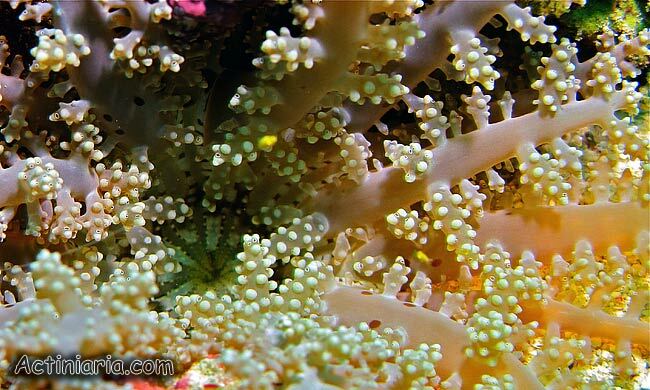 Megalactis comata is said to be more shaggy and lives in thickets of stony corals Acropora and thus can be distinguished from two other Megalactis species which occur on sandy or muddy bottoms. How to distinguish M. hemprichii from M. griffithsi I do not know. In their paper Ardelean and Fautin (2004) provide a table with diagnostic characters of three Megalactis species but in practice it cannot be used to distinguish M. hemprichii from M. griffithsi. Also, I do not know if these two species may be separated basing on their geographic occurrence (whether all specimens from Red Sea should be identified as M. hemprichii and all specimens from Australia, Indonesia and other Pacific localities as M. griffithsi). The specimens on the photos reproduced here are from Pacific so they are identified as M. griffithsi. A possibility exists that M. hemprichii and M. griffithsi are just synonyms (i.e. the same species), in this case valid name will be M. hemprichii since it has a priority (this name is older than M. griffithsi). Certainly the genus deserves further study and undervater photos of specimens from different localities may be very helpful to reveal variability of included species.